Now and then, you may have heard me make the assertion that Dallas County has turned “Blue” and that it is unlikely to turn back, in any seismic way, for the foreseeable future. This issue comes to me today because we’re on the cusp of the 50-year anniversary of the Kennedy assassination. The other night, I spoke with Bill and Nancy Holmes on the phone. Bill was pastor of Northaven (the church I now serve) in 1963, after Kennedy was killed here. He, and just about every other objective observer at the time, made the assertion that Dallas was conservative — even far-right in its politics– at that historical moment. (The new book, “Dallas 1963” chronicles this better than any other source I know). She says they demure on that question since they haven’t lived here in 45 years. Well let me step in and answer the question they can’t. As somebody who does live here, in the same job as Holmes, and who’s paid pretty close attention to changes in our city/county, let me offer some statistics. Not sociological observations. Not personal anecdotes. There’s no better way to answer this question than to look at the highest level voting data available: Presidential election results. — 1992, when Ross Perot stages his quixotic campaign and brought down the totals for both sides. You can see a very clear trend over the past twelve years. Dallas has turned Blue. And the growth appears to be consistent. When folks say, “Dallas used to be a very conservative place,” you can see how that’s true. 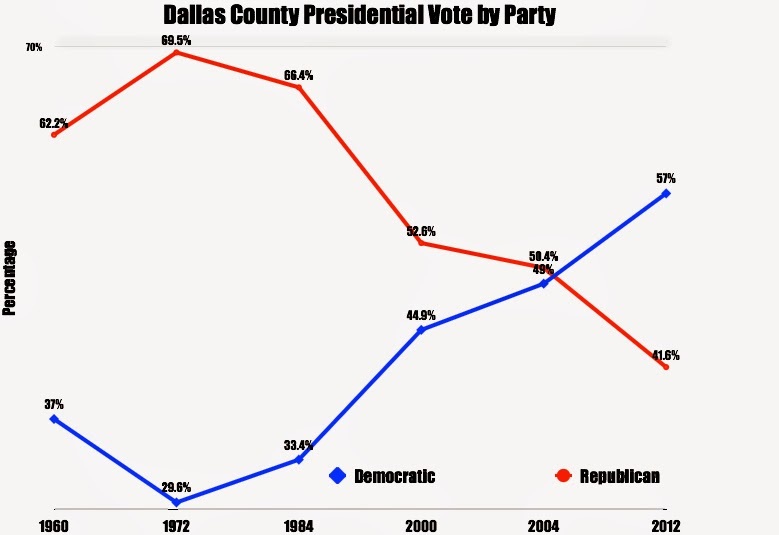 Even when Kennedy/Johnson was winning Texas, Dallas County was voting Republican. That’s really impressive. And, wow, did Dallas County (and the nation) not like George McGovern. But throwing out Reagan and Perot, you can see the overall trend pretty starkly. That year, George W. Bush almost lost to John Kerry, squeaking out a one percent victory. And, don’t miss this: in GWB’s home county!! The better comparison then, is 1960 to 2004 and how far Dallas has come when two so-called “Massachusetts Liberals” were on the ticket. I bring all this up because, now and then I’m in some social setting and this is the conversation. Sometimes I’m with Dallas friends. Sometimes with national friends. And in both cases –among both Republicans, Democrats, and Independents– there is often incredulity. I’ll say, “You know, Dallas has turned Blue,” and they’ll look at me with pity. 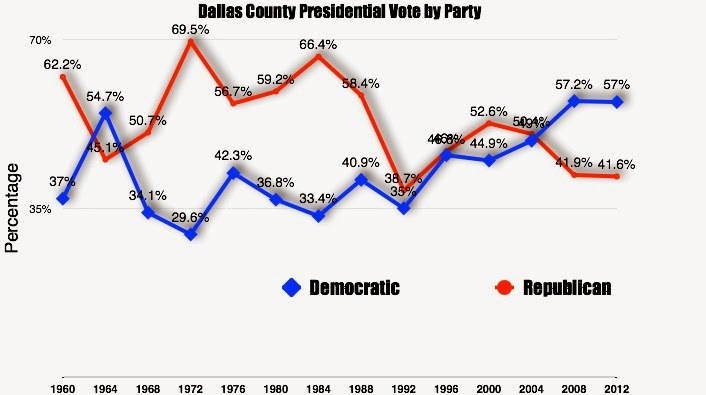 It’s always a frustrating moment, to know the data absolutely supports what you’re saying, but to also know that everybody’s “conventional wisdom” (progressives, moderates, and independents) is still stuck in what they know of Dallas’ past. So, let’s look at that too. 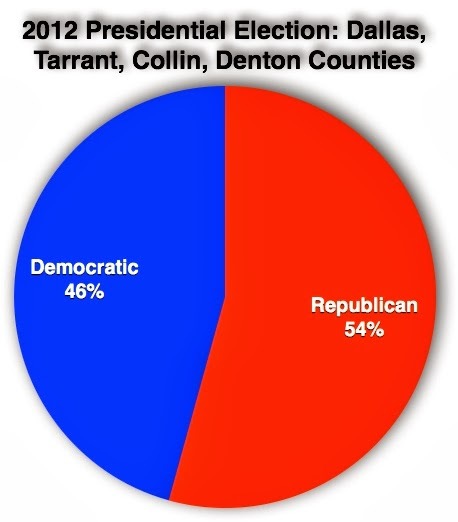 Here’s the same high-level presidential election data from the Obama/Romney election, from the four most populous counties in North Texas: Dallas, Collin, Denton, and Tarrant. Those four make up the heart of the Metroplex, and should give us a very good sense of what the situation is. But, it’s also by no means “Deeply Red” either. Yes, in this environment a 54-46 split is still a healthy win. Often North Texas observers appear to assume that our voting is still at those shockingly high Republican-numbers from decades long ago. But, that’s not a factual view. Said another way: North Texas voting –in its four most-populous counties– is more like Dallas County in 2000 than Dallas County in 1972. Is Dallas County solidly “Blue?” Yes, absolutely. Is North Texas “Deeply Red?” I don’t see how you can say that with a straight face. I’ve heard it several times this past month. Once on KERA, during the THINK Program, and from a Dallas Morning News reporter who was the guest that day. And once from WFAA’s John McCaa, in a story looking back at the Kennedy assassination that featured Bill and Nancy Holmes. McCaa did an excellent job, reviewing the history of Dallas at the time. But one line jumped out at me and made me wince. Again, as we’ve just discussed, that’s a fine opinion. But the data simply doesn’t support that claim. I am sure many people do pride themselves on being conservative. Are there many conservatives in Dallas County? You bet. Very nice ones. Forty one percent of the City/County, statistically. Friends I’ve known my whole life, and members of my family. Decent, decent human beings, and loving people. Are there lot’s in North Texas? Yep. Even a majority, still. North Texas is, more and more, evolving to be much like the nation as a whole…very close to a statistical tie between conservatives and progressives. Fifty-years after the Kennedy assassination –the event that first trained the inquiring eyes of the nation onto Dallas’ politics– it’s important to look at how things are now; not just how we remember them to be. Not only has Dallas turned “Blue,” but Dallas is the “Bluest” county in Texas. That’s right Austin, read on, and weep.